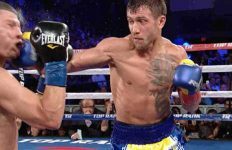 Top Rank and Peltz Boxing put on a pair of world championship fights at the Gila River Arena, in Glendale, AZ, Saturday over ESPN. 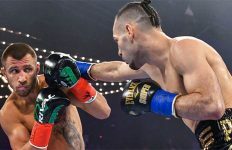 WBO World Lightweight champion Mexican Ray “Sugar” Beltran, 35-8-1 (21), of Phoenix, AZ, was upset by former IBF World Super Featherweight champion Jose “Sniper” Pedraza, 24-2 (12), of Cidra, PR, over 12 rounds. In the first round both boxers landed solid jabs. In the final minute of the round Beltran landed a solid left hook to the body of Pedraza. In the second round Beltran continued to force the fight as Pedraza turned to southpaw landing a right hook to the chin of Beltran. Beltran landed a right to the chin of Pedraza who countered with a left uppercut to the mid-section. Beltran got cut over the left eye from a right hook from Pedraza. Beltran ended the round with his left hook to the chin of Pedraza. In the third round Pedraza came out orthodox and quickly returned to southpaw. Pedraza landed a right hook and left to the chin of Beltran. Beltran landed a right to the chin and followed with a right to the body. Pedraza landed a left hand to the chin knocking Beltran off balance. In the fourth round Beltran kept coming forward but running into Pedraza’s jab and straight left to the chin. Beltran landed a lead right to the chin of Pedraza. In the final seconds of the round Pedraza landed several punches to the head of Beltran. In the fifth round Pedraza took the lead as Beltran went backwards. After Beltran landed several punches Pedraza started moving backwards. Pedraza went back to orthodox. In the sixth round both boxers went to the body. Pedraza forced Beltran against the ropes with both exchanging punches. Beltran came back to force the action. In the seventh round Pedraza used a good jab keeping Beltran off of him. Halfway through the round there was swelling under the left eye of Pedraza. In the eighth round a right hand from Beltran to the chin drove Pedraza back a step or two. Another lead right by Beltran landed on the chin of Pedraza. Beltran landed a right but was countered by a left hook by Pedraza. In the ninth round Pedraza used a snapping right jab keeping Beltran at bay until Beltran landed a right to the chin of Pedraza. Beltran landed a lead right uppercut to the chin of Pedraza. Pedraza landed a lead left to the mid-section of Beltran. In the tenth round Pedraza landed a right bolo punch to the body of Beltran. The fight is going back and fourth. Beltran ended the round with a lead right to the chin of Pedraza. In the eleventh round Beltran landed a double left hook to the body of Pedraza. Beltran landed a lead left hook to the chin of Pedraza. Beltran landed a lead right to the chin of Beltran. 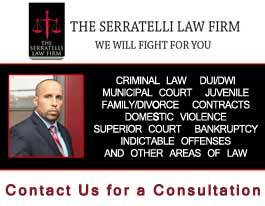 A left uppercut from Pedraza to the chin of Beltran dropped Beltran. Pedraza drove Beltran to the ropes after he got up. In the twelfth and final round Pedraza continues to tie up Beltran. Beltran landed a couple of rights to the head of Pedraza. Pedraza landed a dozen unanswered punches having Beltran in the corner up until the bell. Tony Weeks was the referee. Scores were 117-110 twice and 115-112 as did this writer. “I think the knockdown cost me and I have no excuses,” said Beltran. Pedraza said “I want to thank God and my uncle who is now in Heaven. Also thank Top Rank for this opportunity. Staying focused was the key to victory tonight. I accomplished winning the championship tonight and I want the other champions like Mikey (Garcia),” said Pedraza. 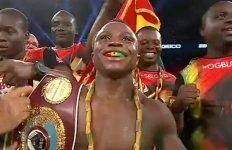 WBO World Super Bantamweight champion Isaac “Brave-Son” Dogboe, 20-0 (14), of Ghana, out of London, UK, stopped No. 6 ranked Hidenori Otake, 31-3-3 (14), of Tokyo, Japan, at 2:18 of the first round. In the first round take opened up first landing a combination. Dogboe dropped Hidenori with a left hook to the chin. Dogboe jumped on Otake with a right cross making Otake touch the canvas with his right glove making it the second knockdown. 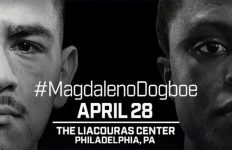 Dogboe again jumped on Otake with several punches ending it with a right uppercut forcing the referee Chris Flores to call a halt. “In all things I give all the credit to the all mighty God. I want to thank ESPN and Otake for taking the fight by signing the contract. All you champions out there let’s get it on,” said Dogbe. Featherweight Francisco “Panchito El Centenario” DeVaca, 18-0 (6), of Phoenix, AZ, defeated Jesus “Gurrumino” Serrano, 17-5-2 (12), of Sonora, MEX, over 10 rounds. Scores were 8-73 twice and 79-72. Former IBF Super Middleweight champion Caleb “Golden” Truax, 30-4-2 (19), of St. Michael, MN, stopped Fabiano “Pit Bull” Pena, 15-11-1 (11), in the third round. Super Featherweight former 2016 Olympian Makela Mayer, 7-0 (4), of L.A., CA, stopped Adina Kiss, 14-8 (8) of Budapest, Hungary, at the end of the third round. In the first round the taller Mayer dropped Kiss with a right to the chin seconds into the round. Kiss got up and Mayer stalked her landing a right to the chin. Just seconds later Mayer landed a left hook to the body after setting her up with a jab. Kiss managed to get through the round. In the second and third rounds Mayer continued to use her jab setting up Kiss as she chased her. Kiss ran to get through the round again. Kiss couldn’t come out for the fourth round of a scheduled 6. Mayer is trained by Philly’s Al Mitchell who coached at Northern Michigan for years. “This is huge for me. I will do what my coach wants. I have a lot of experience in the amateurs and feel ready to win a belt,” said Mayer. 2016 Gold Medal Olympian super featherweight Robson Conceicao, 9-0 (5), of Salvador, BRZ, defeated Edgar “The Beast” Cantu, 7-5-2 (1), of Laredo, TX, over 8 rounds. 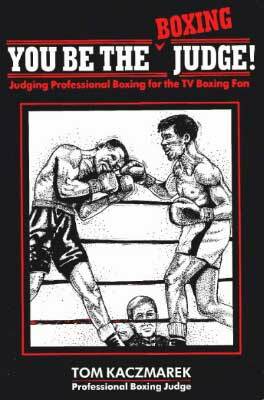 All 3 judges scored 80-71.